Professor Min Sang Kwon in the School of Materials Science and Engineering at UNIST. Their findings have been published in Nature Catalysis on October 11, 2018. Chemicals, such as inks and surfactants, are made of polymers with numerous molecules. Photocatalyst Recipes, which are used to make such polymers, have been developed. By following the order given here, anyone can make the desired catalyst. In the future, it will be possible to design photocatalysts through computers. 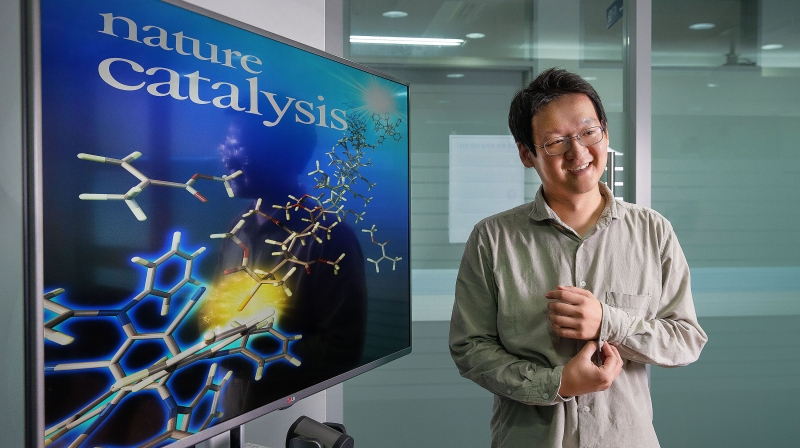 Published in Nature Catalysis, this breakthrough has been led by Professor Min Sang Kwon and his research group in the School of Materials Science and Engineering at UNIST. 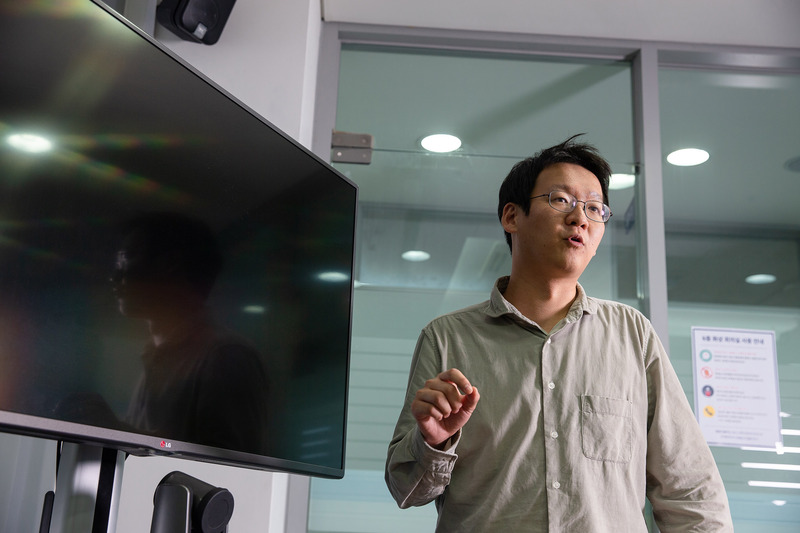 In the study, Professor Kwon has introduced the guideline for obtaining organic photoredox catalysts for the first time. This principle is arranged in a single guide like the computer programming flow chart, but in theory it is possible to develop infinite number of organic photocatalysts. In fact, based on this principle, the researchers developed more than 30 kinds of organic photocatalysts and built libraries. Figure 1. General guideline for organic photoredox catalysts design. Atom transfer radical polymerization (ATRP), which typically requires metal catalysts, is among the most widely used synthetic polymerization methods to prepare well-defined polymers. This technology is expensive because it needs a process to remove metal after synthesis, and it is difficult to completely remove metal, so it can not be applied to electronic or biomedical fields. To solve this problem, ‘Organocatalyzed Photoredox-Mediated ATRP (O-ATRP)’ using organic photocatalyst was developed. However, this technique also requires a large amount of catalyst, and there is a problem that coloration and biotoxicity are exhibited. Monomers are basically required for the synthesis of polymers. The properties of the organic photocatalyst required (for example, light absorption wavelength, oxidation / reduction energy, etc.) vary depending on the type of the monomer. Kwon and his colleagues synthesized the design flow chart (Shown in Figure 2). By defining the desired polymer reaction and then designing the catalyst according to this flowchart and gradually adjusting it, an organic photocatalyst can be easily obtained. Figure 2. Schematic diagram of organic photoredox catalysts. The organic photocatalyst developed by this method successfully synthesized the polymer even if only 0.5 ppm was used. It was also possible to use monomers that were difficult to use in O-ATRP. The first author of this study is Dr. Varun Kumar Singh in the School of Materials Science and Engineering at UNIST and Distinguished Professor Kwang S. Kim in the School of Natural Science (National Scientist) and Dr. Johannes Gierschner of the Madrid Research Center in Spain partook in the research, as corresponding authors. Besides, Jiseok Lee (Department of Chemical Engineering, UNIST) and Lee Soon Park (Department of Materials Science and Engineering, UNIST) took part in the study as co-authors. 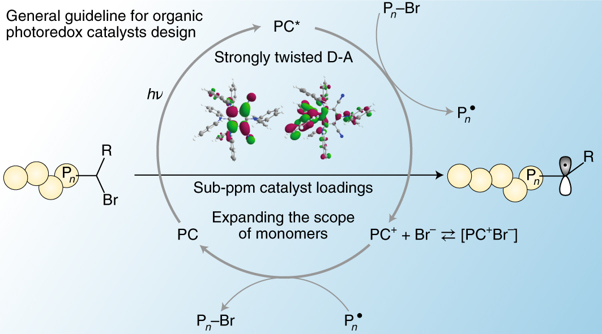 Varun Kumar Singh, et al., “Highly efficient organic photocatalysts discovered via a computer-aided-design strategy for visible-light-driven atom transfer radical polymerization,” Nature Catalysis, (2018).